The Australian Lunar Series II Year of the Dragon Ten-Coin Set was minted in 2012 by the Australian Perth Mint. The set is comprised of nine quality colored silver coins and a simple silver bullion coin, which resembles to the gold coin, being distinguished only by the precious metal used in the manufacturing process. The total weight of the Australian Lunar Series II Year of the Dragon Ten-Coin Set is 311.00 grams therefore each coin weighs 1oz of 99.90% pure silver. All these 10z silver coins come in a presentation case and in Australia they were issued as legal tender. Regarding the Australian Lunar Series II Year of the Dragon Ten-Coin Set, the reverse of nine silver coins is colored, the obverse remaining the same for all the ten bullion coins minted in high quality. The reverse of the Australian Lunar Series II Year of the Dragon Ten-Coin Set illustrates a Chinese dragon together with a pearl which was engraved in such a spectacular high relief that impresses every viewer. The inscription Year of the Dragon is also present in Chinese characters. The head side of the Australian Lunar Series II Year of the Dragon Ten-Coin Set is a depiction of a great leader, a woman with a great long reign, Queen Elizabeth II. This portrait facing right was engraved by Ian Rank-Broadley. On the obverse it is also inscribed ELIZABETH II AUSTRALIA, 1oz 999 SILVER, the minting year 2012, and the denomination 1 DOLLAR. This exemplary model of beautiful and unique engraver, the Australian Lunar Series II Year of the Dragon Ten-Coin Set issued in 2012, comes in an incredibly scarce mintage; there were minted only 2,500 sets for the international collectors and investors. There are not much left available for trade so people should consider investing in these Lunar Dragon silver bullion coins. 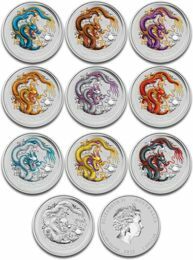 The Australian Lunar Series II Year of the Dragon Ten-Coin Set is full of color, of excitement for every collector and investor, and is characterized by high bullion qualities that come together with scarce mintage and high demand. These factors will increase the value of this Australian 10 silver coins issued in 2012. And also the profitability of these coins increases as the price for silver increases. Thanks to the case in which the Australian Lunar Series II Year of the Dragon Ten-Coin Set comes which is such an exquisite presentation, due to their immense present and future value, and due to the quality and colored dragons used in producing these coins, this set can make for a special present. The persons born in the dragon year are those born in 1940, 1952, 1964, 1976, 1988, 2000, and 2012. Through this present you will transmit them that they are brave, charismatic, great entrepreneurs, and passionate. Due to this scarce mintage they were sold immediately after the Perth Mint issued them. Fortunately, for all the interested parties, the Australian Lunar Series II Year of the Dragon Ten-Coin Set from 2012 is available on our website.